The big draw in the Royal Academy’s new show on American painting during the 1930s is the iconic painting “American Gothic” by Grant Wood. The stern-looking father and daughter pair – actually posed by Wood’s sister Nan and his dentist, Dr. Byron McKeeby – standing in front of their Carpenter Gothic house remains one of the most recognizable images in American art. It was acquired soon after its completion in 1930 by the Art Institute of Chicago, who in an act of great generosity have loaned its greatest treasure for this travelling exhibition, which comes to the Royal Academy from the Musée de l’Orangerie in Paris. No other painting in the history of art, except perhaps Edvard Munch’s “The Scream”, has been so endlessly parodied. It’s safe to assume that Wood, reportedly a man of fastidious tastes, would be appalled that his most famous work has since been used to sell products as diverse as cleaning fluids, video games and beer. 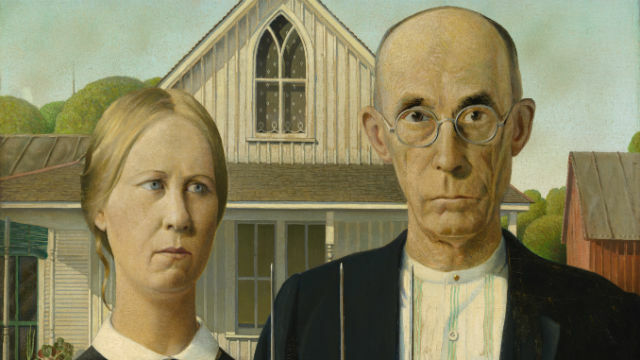 But wasn’t “American Gothic” always intended to be tongue-in-cheek? In fact, Wood always denied that he was poking fun at Midwestern folksiness, although another painting by him here, “Daughters of Revolution”, showing three “Tory gals” standing in front of “Washington Crossing the Delaware”, is more obviously satirical. Poor old Wood. Compare the fortunes of “American Gothic” to that of another memorable image of the Depression years, Dorothea Lange’s photograph of a destitute pea-picker and her children, “Migrant Mother”: nobody would ever dream of parodying that. This exhibition charts the course of American painting during the unsettled period after the financial crash of 1929. Many works of art – indeed, many of the artists – in the show will be a new to British gallery goers. 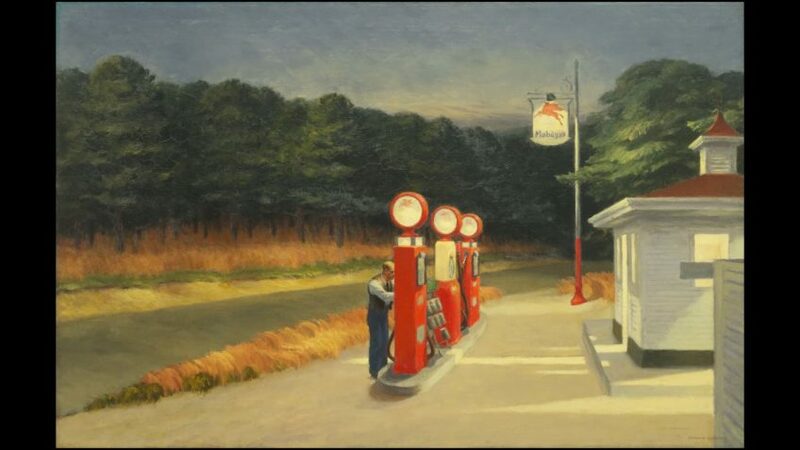 Of course, we all know Edward Hopper, who’s represented by two works, the celebrated “New York Movie” and a painting that for some reason always makes me shudder, “Gas”. There’s Georgia O’Keefe, too, the subject of a big show at Tate Modern only last year. Other artists, though, including such fine talents as Thomas Hart Benton, Alice Neel, and my personal favourite here, the creepy Magic Realist painter Ivan Albright, will be much less familiar. What becomes apparent is the sheer diversity of American art in this period. Inevitably, a lot of space is devoted to “American Scene” or Regionalist painting by Wood, Benton and lesser talents such as John Steuart Curry. Other artists like Stuart Davis and Reginald Marsh, meanwhile, chronicled the urban scene, while Charles Demuth tackles the industrial landscape in his Precisionist “River Rouge Plant”. Peter Blume’s “Eternal City” attempts, not entirely successfully, to re-work European Surrealism in an American idiom, while “The Fleet’s In!” by Paul Cadmus is pure camp. There’s much that’s overtly political, such as Joe Jones’ “American Justice”, which depicts the grim aftermath of a lynching. Social Realism takes centre stage, but there’s also a fair amount of abstraction and even, as in Charles Green Shaw’s pack of Wrigley’s Spearmint hovering above the Manhattan skyline, stuff that seems to anticipate Pop. My only criticism of the show, staged upstairs in the Sackler Wing, is that it’s rather small – just 45 works by thirty-odd artists – making it feel at times rather like a whistle-stop tour of such a huge subject. But I suppose this is understandable, given the risks involved in staging a show featuring so many little-known, albeit intriguing, artists. “America after the Fall” serves as a sort of coda to the Royal Academy’s recent, well-received blockbuster on Abstract Expressionism. There’s even some overlap at the end, with early works by future “AbEx” artists such Jackson Pollock and Philip Guston. You’re reminded of how much was later swept away in the anxiety to create a truly American art form, so much so that in 1954 the critic Clement Greenberg could write that “abstraction is the major mode of expression in our time; any other mode is necessarily minor”. Not that the Realists gave in without a fight: Wood died aged only 51 in 1942, but Hopper and, in particular, Benton would later stage a vigorous defence of traditional painting. Nowadays, of course, it’s “AbEx” that looks old hat, and in recent years, words like “figuration”, “realism” and even “life model class” have once again become acceptable terms in contemporary art.